#10 Oliver Ames, 5 @ #2 Dighton-Rehoboth, 2 – Final – Click here for a recap of this game. The Tigers advance to the Div. 2 South semifinal to face #11 Westwood on Thursday at 7:00 at Rockland High. #12 North Attleboro, 6 @ #4 Marshfield, 1 – Final – North Attleboro plated two runs in the first inning, one in the fifth and three more in the top of the sixth. Olivia Capobianco had three hits, three stolen abses and two RBI and Sam Courtemanche added two hits and an RBI. Meg Barlow and Andrea Miceli each added an RBI for Big Red. Bella Erti scattered five hits and didn’t issue any walks, striking out eight in the win. The Rocketeers advance to the Div. 1 South semifinal to face #1 Silver Lake on Thursday at 7:00 at Taunton High. #12 King Philip, 7 @ #1 Franklin, 15 – Final – Franklin built an 8-3 lead at halftime and never looked back in the D1 East Semifinal matchup with KP. Freshman Erin Walsh led the way with seven goals, Annie Walsh (eight draws) added four goals and Kendall Reardon found the back of net twice. Halle Atkinson and Grace McDermott each had three draw wins for Franklin. The Panthers advance to their third Div. 1 East Final in the past four years and will face #2 Concord-Carlisle on Friday at 7:00 at Milford High. #3 Foxboro, 12 @ #2 Wayland, 11 – Final – Meghan Curran scored two goals and recorded seven assists to help the Warriors reach the first Div. 2 East Final in program history. Sophia DiCenso and Caroline McGeary each had hat tricks and Sarah Addeche made 15 saves for Foxboro, which will face #1 Walpole on Friday at 5:00 at Milford High. #1 Sharon, 4 vs. #4 Bishop Feehan 1 – Final – The Eagles advance to the Div. 2 South final to face #3 Scituate on Friday at 3:00 at Rockland High. TAUNTON, Mass. – North Attleboro head coach Bill Wallace knew he had the game plan to beat Taunton, it was just a matter of execution. All 12th-seeded North Attleboro had to do was play perfect. Big Red was nearly flawless on the defensive end, came up with timely hitting and walked away from Jack Tripp Field with a 4-1 upset win over fifth-seeded Taunton. Freshman Bella Erti pitched a complete game for the Rocketeers, scattering eight hits and one walk and struck out won to earn her second straight postseason win. It took Taunton just three batters to take the lead in the bottom of the first. Sophomore Jaime Brown led off with a single, advanced to second on a sac bunt from junior Liane Duarte and scored on an RBI double from junior Kya Enos to put the Tigers ahead early. The Tigers had at least one runner on base in every inning after that except for the sixth and had a runner reach third in three of those innings but couldn’t get another run in. Big Red took a couple of innings to get its offense in gear. The Rocketeers went down in order in both the first and second inning and had just one hit in the third – an Andrea Miceli single – and just a two-out single from Erti in the fourth. North finally broke through in the fifth inning. Sam Courtemanche reached after a throwing error to first and took second on the same play. Freshman Ashley Cangiano laid down a bunt and beat the throw to put runners on the corners for Big Red. With both the infield and the outfield playing in, Abby Gallagher laced a hard grounder up the middle, the ball hitting the edge of the outfield grass and hopping over Taunton’s center fielder. Both runs came in to score and Gallagher took third on the play. Meg Barlow delivered a single in the next at-bat to plate Gallagher and give North Attleboro a 3-1 lead. Taunton was close to coming up with a big response in the bottom of the fifth. Enos reached on an infield error and went to third on a one-out double to right field from MacKenzie Handrahan. A line drive to center was snagged by Olivia Capobianco and she fired a strike home to get the runner on the tag up, ending the threat. “That was the play of the game,” Wallace said of Capobianco’s throw. North Attleboro pushed an insurance run across in the top of the seventh. Gallagher reached on Taunton’s sixth error of the day and moved to second on a sac bunt from Capobianco. Barlow just just a piece of the ball, putting it in the dirt right in front and the throw from first hit both Barlow and Taunton’s first baseman, allowing Gallagher to score. Taunton threatened once again in the bottom of the seventh inning with Duarte (error) and Enos (walk) reaching with two outs, but Erti got a line drive to Cangiano in left field for the final out. North Attleboro softball (13-6) advances to the D1 South Quarterfinals and will take on the winner of #4 Marshfield (15-3) and #20 Mansfield (13-8) on a date and time to be announced. Taunton finishes at 17-5. #4 Mansfield, 2 vs. #13 Wellesley, 3 – Final – Click here a recap of this game. #10 Oliver Ames, 8 @ #7 Pembroke, 1 – Final – After falling behind 1-0 in the bottom of the third, Oliver Ames took the lead with two runs in the top of the fourth and broke the game open with six runs in top of the seventh. Junior Mitch Goulet had three hits, including two doubles, knocked in two runs and scored one while Evan DeMartinis added three hits, three stolen bases, an RBI and a run scored. Sam Burr earned the win for the Tigers, allowing one run on five hits and two walks in six innings of work while striking five. Chris Pearsons (two RBI, two runs), didn’t allow a hit in a scoreless seventh inning. Oliver Ames advances to the D2 South Quarterfinals. The Tigers will play either travel to #2 Dighton-Rehoboth or host #15 Hingham or #18 Dartmouth on Monday at 4:00. #15 Foxboro, 0 @ #3 Norton, 1 – Final – Foxboro senior Colin Thoener tossed a one-hitter and struck out five but Norton pushed across an unearned run in the sixth inning to edge the Warriors. Foxboro had five hits as a team and put the tying run on third in the seventh but couldn’t level the game. #9 King Philip, 14 vs. #24 Notre Dame Academy, 2 – Final (5 inn.) – King Philip slugged 14 total hits with Brooke Taute leading the way, recording three hits and four RBI as the Warriors handled Notre Dame in the opening round of the D1 South tournament. Meg Gorman, Nicole Carter, Sydney Phillips and Jenn Hutnyan all had multiple hits — Hutnyan putting an exclamation point on the game with a home run to end it. Hutnyan allowed just three hits while earning the win in the circle. King Philip advances to play at #8 Bishop Feehan on Saturday at 3:00. #12 North Attleboro, 8 vs. #21 Whitman-Hanson, 0 – Final – North Attleboro freshman Bella Erti dazzled in her postseason debut, allowing just one hit and striking out five to lead Big Red to a big win over visiting Whitman-Hanson. Meg Barlow led the offense with three hits, including two doubles and Bella Erti had two hits, including a triple. Liz Morehouse, Sam Courtemanche and Andrea Miceli all contributed to the big offensive performance with two hits apiece while Abby Gallagher and Kat Munley both scored a pair of runs. North Attleboro advances to play #5 Taunton on Saturday at 7:00. #20 Mansfield @ #13 Durfee – Postponed to Saturday, 6/3 at 3:00. Mansfield holds a 3-0 after two innings of play. #22 Attleboro @ #11 Somerset Berkley – Postponed to Saturday, 6/3 at 3:00. #9 King Philip, 6 @ #8 Natick, 3 – Final – Click here for a recap of this game. #4 North Attleboro, 6 vs. #5 Concord-Carlisle, 7 – Final (OT) – North Attleboro and Concord Carlisle were tied after the first quarter, again at halftime, and again at the end of regulation. CC scored the tying goal with nine seconds to play and then potted the winner after North clanked the iron on the offensive end. Jack Dakin and Zach McGowan each scored twice for North while Tommy Lindstrom and Jason McNeany each found the back of the net once. #1 Franklin, 18 vs. #8 Natick, 10 – Final – Click here for a recap of this game. #3 Foxboro, 20 vs. #6 Weston, 8 – Final – Foxboro advances to the D2 East Semifinals and will travel to #2 Wayland on a date and at a time to be announced. #5 King Philip, 4 vs. #12 North Quincy, 1 – Final – King Philip swept doubles play and won two singles matches while only dropping two games to beat visiting North Quincy. Ryan Gemelli and Sam Colella won 6-2, 6-3 at first doubles and Aidan Ignatius and Marco DiStefano recorded a 6-1, 6-0 win at second doubles. Blake Ginter didn’t lose a game in a 6-0, 6-0 win at second singles and Martin Matous walked away with a 6-1, 6-1 win at third singles. King Philip advances to the D1 South Quarterfinals and will play at #4 BC High on a date and at a time to be announced. #7 Franklin, 4 vs. #10 Brockton, 1 – Final – Franklin advances to the D1 South Quarterfinals. The Panthers will play the winner of #2 Brookline and #18 Natick on a date and at a time to be announced. #7 Foxboro, 4 vs. #10 Falmouth, 1 – Final – Foxboro advances to the D2 South Quarterfinals and will play the winner of #2 Duxbury and #15 Apponequet on a date and at a time to be announced. #6 King Philip, 4 vs. #11 North Quincy, 1 – Final – King Philip advances to the D1 South Quarterfinals and will play the either #3 Newton North, #14 Needham or #19 Framingham on a date and at a time to be announced. #7 North Attleboro, 4 vs. #10 Braintree, 1 – Final – North Attleboro registered two wins in singles play and won both doubles matches to beat visiting Braintree. Junior Emily Chiasson won 6-1, 6-2 at first singles and junior Jordan Willis won 6-0, 6-0 at second singles. The team of senior Gabby Duva and junior Azka Siddiq won 6-1, 6-0 at first doubles and senior Hana Hershey and junior Katie Demontigny recorded a 6-2, 6-4 win at second doubles. North Attleboro advances to the D1 South Quarterfinals and will play either #2 Wellesley, #15 Bishop Feehan or #18 Mansfield on a date and at a time to be announced. #5 Taunton, 0 @ #4 Wellesley, 3 – Final – Click here for photos from this game. Stoughton, 5 @ Brockton, 3 – Final – Stoughton senior Luke Johnson tossed a complete game and his teammates backed him up with strong defense as the Black Knights punched their ticket to the postseason. Johnson struck out one, scattered eight hits and allowed three runs. Offensively, Ryan Sullivan went 2-for-3 with a triple, a run scored and two RBI, Jack Connelly went 2-for-4 with a double, a run scored and an RBI and Evan Gibb chipped in with two hits and played well defensively behind the plate. North Attleboro, 1 @ Franklin, 2 – Final – North Attleboro freshman Bella Erti allowed just three hits but thats all the Panthers would need in a close non-league win over the Rocketeers. Big Red took the lead in the top of the fourth when Erti tripled and scored on a double by Sam Courtemanche. Franklin answered in the bottom of the fourth with a single from Olivia DiGiacomo and then a two-run home run by Clara DeCarvalho. Jackie Cherry earned the win for Franklin, striking out six. FHS head coach Kate Fallon-Comeau noted DiGiacomo made some outstanding defensive plays in right field as well. King Philip, 5 @ Bishop Feehan, 10 – Final – Hailey McCasland had two hits and knocked in a pair of runs but the Warriors fell to Feehan. Jess Bonner, Nicole Carter, Bri Lacy and Sydney Phillip also had two hits apiece for King Philip. Sharon, 0 @ Milford, 12 – Final (5 inn.) – Milford senior Ali Atherton had a perfect game through 4.2 innings before the Eagles registered an infield single. Atherton, who earned the win, struck out 10 and helped her cause on offense with a pair of hits, including a double. Offensively, Emily Piergustavo went 2-for-3 with a double, a home run and two RBI, Jess Tomaso went 4-for-4 with a pair of doubles and three RBI, Kate Irwin was 4-for-4 with three runs scored and an RBI and Kaitlyn DeCapua had two hits and two RBI. North Attleboro, 2 @ Foxboro, 3 – Final – Foxboro swept singles play, earning the deciding point with a three-set match at third singles. Sophia Prinos won 6-0, 6-2 at first singles, Lexi Nelson took a 6-0, 6-3 victory at second singles and Kayla Prag prevailed with a 6-1, 0-6, 6-0 win at third singles. North Attleboro’s Katie DeMontigny and Azka Siddiq won 6-2, 6-0 at first doubles and Hana Hershey and Shurobhi Nandi won 3-6, 7-5, 12-10 at second doubles. Foxboro, 58 @ Canton, 78 – Final – John Guenthner was a double winner and Canton took first in nine events against Foxboro. Guenthner won the 400M hurdles (58.8) and the 110M hurdles. Other winners for Canton include Cordell Smith (high jump, 5’8), Jack Healey (1 mile, 4:57.5), Muhammed Sambo (400M, 52.3), Gerry Sullivan (800M, 2:12.6), Riley McDonnell (200M, 23.8), Colin Messinger (2 mile, 10:38.5) and both the 4×100 and 4×400 relay teams. Foxboro, 82 @ Canton, 54 – Final – Canton’s Sarah Collins won a pair of events, qualifying for state in one race, but fell short to Foxboro. Collins qualified for the state tournament in the 400M hurdles, clocking in at 68.8 while also winning the 800M in 2:30.2. Jimisha Williams took first and qualified for states in the 200 at 27.3, Erika Lum won the high jump at 4’10, and Bronwyn Mahoney was a double winner, taking first in the shot put (28’8) and the discus (71’8.5″). Canton’s 4×400 team also clocked in first. Attleboro, 3 @ Foxboro, 4 – Final – Foxboro junior Joe Freitas’ third hit of the game broke a tie game, handing the Warriors the lead in the bottom of the sixth inning. Freitas (3-for-3) slapped a two-out RBI single to bring the game-winning run home for Foxboro. The Warriors held a 3-1 lead until Attleboro tied the game with two runs in the top of the third. Foxboro’s Colin Thoener tossed a complete game to earn the win, allowing just one hit and no earned runs. He struck out seven. Oliver Ames, 0 @ Canton, 1 – Final – Canton scored an unearned run in the first and that was all that junior Robbie Wilkinson needed, as he tossed a complete game shutout and allowed only four hits on 76 pitches, striking out two. Sophomore Tom Parker was just about as good on the hill for the Tigers, allowing no earned runs and only four hits in the loss. Sam Burr accounted for two hits for the Tigers. Franklin, 4 @ Sharon, 0 – Final – Franklin junior Bryan Woelfel tossed a complete game shutout and senior Jake Lyons had three hits to pace the Panthers past Sharon. Woelfel earned the win by going the distance, allowing just four hits, two walks and retiring seven batters on strikes. Lyons had a double and a run scored while Ryan Hodgkins had two hits and a run scored and Tyler Gomes went 1-for-1 with a walk and a sacrifice fly. King Philip, 8 @ North Attleboro, 7 – Final – King Philip’s offense got off to a strong start with five runs in the first inning but had to rally when the Rocketeers put up seven straight runs. North tied the game with five runs in the second and went up 7-5 on two runs in the fourth. KP tied the game up with two runs in the fifth and knocked in the winning run in the sixth inning. KP totaled 11 hits as a team with Will Weir going 3-for-4, Ben Furfari added two hits and Jeremy Rhines recording two RBI. Jack Webster earned the win in relief while Dan Antunes picked up the save, tossing two innings without giving up a hit. Mansfield, 12 @ Milford, 4 – Final – Mansfield’s offense wasted little time to get going, scoring two runs in the first inning and then adding on three runs in each the second, third and fourth innings. The Hornets tacked on their final run in the sixth. Colin Gibbons had the big day at the plate for Mansfield, going 2-for-4 with five runs knocked in, Anthony DeGirolamo was 2-for-2 with a pair of walks and four runs scored, Matt Farragher had four hits and three runs scored and Max Boen recorded three hits and scored three runs. Kevin Dow earned the win, allowing just one earned run in five innings of work. David Simmons was solid in two innings of relief, allowing just one hit with three strikeouts. Taunton, 3 @ Stoughton, 4 – Final – Stoughton scored three runs in the bottom of the seventh to prevail with a win over Taunton. The Tigers held a 3-1 advantage heading into the final inning but the Black Knights rallied to load the bases. Senior Ryan Sullivan came through and a bases-clearing double to walk off with the win. Ruben Gonzalez knocked in Stoughton’s first run with an RBI double while Pat Hagerty was 2-for-2 with two runs scored for the Black Knights. Justin Hutchinson earned the win in two innings of relief, allowing two hits and retiring three batters on strikes. Tyler Medeiros had a strong outing for the Tigers, striking out six with four hits allowed and just one run in six innings of work. Canton, 8 @ Oliver Ames, 11 – Final – Oliver Ames surged ahead to take a 9-7 lead in the fifth inning and tacked on two insurance runs in the sixth to beat Canton. Lexie Campbell was 3-for-5 with an RBI and a run scored, Caroline Mahoney went 2-for-4 with a run scored and three RBI, Rachel Han had a home run and scored a pair of runs, Kayla Georgeu had one hit, two runs and two RBI and Alyssa Gavin added an RBI. 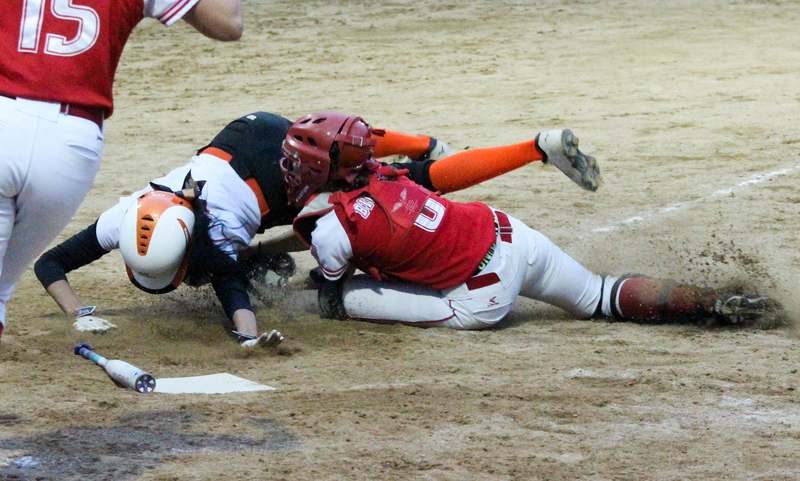 Sharon, 1 @ Franklin, 7 – Final – Franklin’s offense started strong with a pair of runs in the first inning, tacked on single runs in each the third and the fourth and then put an exclamation point on the win with three more runs in the sixth inning. Jackie Cherry earned the win with five innings of work while Emily Valentino earned the save, retiring all six batters she faced. Alexx Niss went 3-for-4 with four RBI to pace Franklin’s offense while Olivia DiGiacomo was 2-for-4 with three runs and two assists from right field and Ally Shea recorded two hit and an RBI. FHS head coach Kate Fallon-Comeau said Tara Hartnett (shortstop) and Alyssa DaSilva (first) both had strong defense games for the Panthers. North Attleboro, 5 @ King Philip, 6 – Final – King Philip’s Sydney Phillips had a standout performance at the plate, collecting three hits and knocking in two runs to help the Warriors edge Big Red. Nicole Carter also knocked in a pair of runs in KP’s win. Elise Pereira came on in relief and provided two scoreless innings for the Warriors. Ashley Cangiano had a pair of triples and drove in a pair of runs and Sam Courtemanche went 3-for-4 for the Rocketeers. Olivia Capobianco had three stolen bases and two runs scored for North. 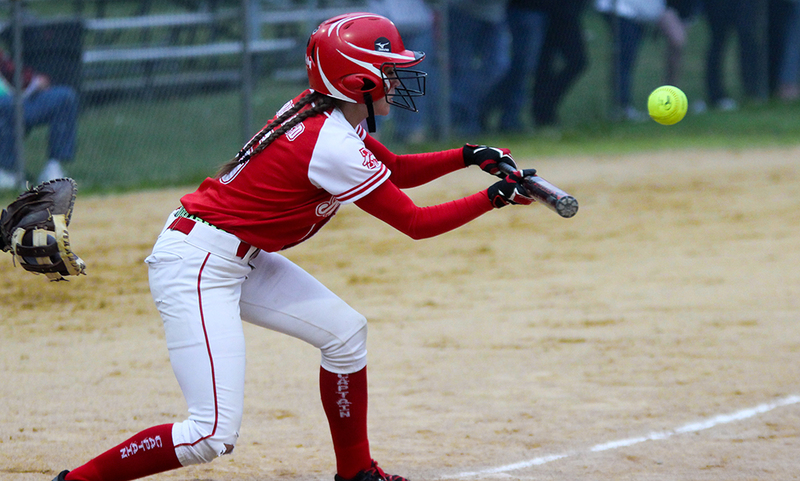 Milford, 11 @ Mansfield, 2 – Final – Milford junior Emily Piergustavo hit for the cycle to continue her offense hot streak and the Hawks picked up a big win on the road. Piergsutavo was 4-for-5 with three RBI and two runs scored while Kaitlyn DeCapua also had four hits, scoring once and knocking in three runs. Maggie Farrell was 3-for-3 with a double and two runs score and Maddy Bonvino had two hits, including a triple and an RBI. Kelley Reichert struck out four in a complete game effort to earn the win while also helping the offense with a three-run home run. Sarah Cahill and Caty DeMassi each had a hit Hornets. Stoughton, 1 @ Taunton, 4 – Final – Eighth grader Kelsey White gave up one unearned run and just four hits in her first varsity start. White struck out nine and walked none in a complete game win. Stoughton took the lead but Taunton tied it in the third with a single run and then took the lead in the fifth on an single by Hannah Aldrich that plated pinch runner Alexa White. A leadoff double in the sixth by McKenzie McAloon started a two-run rally that sealed the win for the Tigers. One run scored on an grounder by Jaime Brown and the second on a single by Kya Enos. Stoughton was led offensively by Karly Estremera with two hits and the team’s lone run. Franklin, 19 @ Stoughton, 0 – Final – Thirteen different players found the back of the net as Franklin recorded a league win in its first ever meeting with Stoughton. Zach Alexander recorded a hat trick, including one off an assist from his brother Jacob (goal, two assists). Nitin Chaudhury also had a hat trick for the Panthers. Oliver Ames, 1 @ Mansfield, 13 – Final – Tommy Donnelly and Josh London had strong days on defense for the Hornets, who rolled to a big win at home. North Attleboro, 17 @ Milford, 4 – Final – Andy DeMattio found the back of the net four times, had one assist and scooped up four ground balls to lead the Rocketeers to a big win. Zach McGowan recorded two goals and two assists, Jason McNeany (15 face off wins) scored twice and had one helper, Colin Young, Dan MacDonald and Jack Dackin each scored once and had one assist and Hunter Sarro had a pair of helpers. Nick Ward, Paul Yeomans, Max Fontes, Zac Doucette and Dan Conroy each tallied a goal for the Rocketeers while Jack Connolly had an assist. Jack Puccio (six saves) and Jake McNeany (five saves) split the game in net for North. Franklin, 15 vs. North Andover, 5 – Final – Franklin sophomore Annie Walsh had a standout performance, netting a team-high six goals to pace the Panthers. Jordan Jette had four assists to go along with one goal, Erin Walsh scored a hat trick and had one helper, Caroline Lounsbury also netted a hat trick and Kelsey MacCallum scored a pair of goals and added one assist. FHS head coach Kristin Igoe Guarino said Halle Atkinson had a strong game in the midfield with two draw controls and two ground balls. King Philip, 21 @ Taunton, 4 – Final – Katie Crowther led the way for King Philip with six goals and the Warriors had 14 different players tally at least one goal. Caroline Watson made eight saves in net for KP while Christina Hathaway scored her first goal. Olivia Tormey and Caroline Klim each scored two goals in the win. Alana Tavares and Delaney Powell each scored a pair of goals for the Tigers and Lorna Li made 19 saves in the loss. Mansfield, 14 @ Oliver Ames, 10 – Final – Oliver Ames’ Kendall Clifford found the back of the net five times and Chloe Kikelly scored a hat trick but the Tigers fell just short to Mansfield. OAHA head coach Abby Tepper said Katie Davenport, Sydney Hedrick, Grace McCallum and Dimitra Efremidis all played great defensively. Ari Waldorf made 15 saves in net for the Tigers. Milford, 4 @ North Attleboro, 16 – Final – Chloe Olsen had three goals and three assists for the Rocketeers. Kenzie Rosenberg and Camille Pizarro each had four goals on the day for North, while Julia Tolfa had a pair of goals and Julia Noreck scored one goal and played stout defense, according to head coach Mike Vitelli. Sharon, 5 @ Franklin, 0 – Final – Sharon prevailed from a competitive match with a win on the road, taking all five matches in straight sets. Senior Griffin Fein won 6-2, 7-5 at first singles, junior Fred Bondar won 6-4, 6-0 at second singles and junior Andre Olivei won 6-0, 6-1 at third singles. The team of senior Alex Romantz and freshman Alberto Olivei recorded a 6-3, 6-4 win at first doubles and sophomore Danujan Thirumavalavan and junior Ashwin Sreevatsa took a 6-3, 6-0 win at second doubles. North Attleboro, 2 @ King Philip, 3 – Final – King Philip won a pair of matches in singles play and came away with a key win at second doubles to edge Big Red. The team of Aidan Ignatius and Marco DiStefano prevailed with a 6-4, 6-3 win at second doubles for KP while Cole Ginter took a 6-1, 6-1 decision at first singles and Martin Matous notched a 6-3, 6-3 win at third singles. North’s Barsomo Nuay won 6-3, 7-5 at second singles and the team of Daniel Zhang and Ben Pfeffer won 6-2, 6-3 at first doubles. Stoughton, 1 @ Taunton, 4 – Final – Taunton picked up two wins in singles and two wins in doubles to take down Stoughton. Sophomore Brett Beaulieu won 6-1, 6-1 at first singles and junior Mike Briggs took a 6-2, 6-2 win at second singles. The team of sophomores Dylan Kullas and Charlie Fiske won 6-1, 6-1 at first doubles and junior Kyle Dennehy and freshman Alex Pugh won 7-6 (7-4), 6-2 at second doubles. Attleboro, 0 @ Foxboro, 5 – Final – Foxboro won all five matches in straight sets to defend home court against Attleboro. Sophia Prinos notched a 6-0, 6-0 win at first singles, Lexi Nelson won 6-0, 6-0 at second singles and Kayla Prag recorded a 6-3, 6-1 win at third singles. The team of Olivia Dantona and Morgan Krockta picked up a 6-3, 6-2 decision at first doubles and the team of Jacey Nicklas and Kendall Milender walked away with a 6-1, 6-1 victory. Oliver Ames, 4 @ Canton, 1 – Final – Oliver Ames won at second and third singles and swept doubles play to take down Canton. Claudia Ferrara won 6-2, 6-2 at second singles and Maura Kiernan took a 6-7 (3-7), 6-3, 10-5 win at third singles. The team of Tori Wyman and Tate Hadges notched a 6-3, 6-3 win at first doubles and Kristin Bloumbas and Eva Belanger teamed up for a 6-4, 6-4 win at second doubles. Canton’s Emma Sokolovsky won 6-2, 6-2 at first singles. Franklin, 1 @ Sharon, 4 – Final – Franklin’s Hannah Sweeney recorded a big win at first singles but Sharon only lost one game total in the other four matches to beat the Panthers. Sweeney won 7-6 (7-4), 6-1 at first singles but Sharon’s Emily Zhang and Lulu Yuan each won 6-0, 6-0 at second and third singles, respectively. The team of Katie Merport and Emily Wen won 6-1, 6-0 at first doubles and Rithika Neti and Sophia Fein paired up for a 6-0, 6-0 win at second doubles. King Philip, 2 @ North Attleboro, 3 – Final – North Attleboro’s second doubles team of Hana Hershey and Katie Demontigny prevailed in three sets to give Big Red the edge of the Warriors. Hershey and Demontigny won 6-2, 3-6, 6-2 at second doubles while Azka Siddiq and Gabby Duva won 6-0, 6-2 at first doubles. Jordan Willis notched North’s lone in singles with a 6-0, 7-5 victory at second singles. KP’s Becca Ricci won 6-2, 6-4 at first singles and Meghan Sepich won 6-1, 6-0 at third singles. Mansfield, 4 @ Milford, 1 – Final – Mansfield went on the road and swept singles play to notch a win over Milford. Paulina Martin won 6-0, 6-0 at first singles, Sarah Doyle won 6-1, 6-0 at second singles and Elizabeth Elsner completed the sweep with a 6-1, 6-4 win at third singles. Mansfield’s fourth win came via Chloe Peters and Tessa Garufi, with a 6-1, 6-0 win at first doubles. Milford’s Angela Pillarella and Ashlyn Oliveria won 4-6, 6-1, 1-0 at second doubles. Taunton, 5 @ Stoughton, 0 – Final – Taunton lost a total of just three games in a convincing win on the road. Vanessa Rosa (third singles) and the team of Ashleigh Eason and Emily Moor (first doubles) both won 6-0, 6-0. Olivia Sweeney (first singles) and Jillian Pagliuca (second singles) each won 6-1, 6-0 while the team of Jordan Martin and Callie Hebert won 6-0, 6-1 at second doubles. Taunton, 3 @ Quincy, 1 – Final – Taunton’s Nate Grant dished out 43 assists and the Tigers notched their second win over Quincy (25-15, 14-25 25-12, 25-20) in less than a week. Grant also had two kills and three blocks while Lance Law had a team-high 15 kills and had one block. Lens Esquil had five blocks as well as 13 kills while David Fusiecki had 10 kills and 11 digs. North Attleboro, 2 @ Attleboro, 3 – Final (9 inn.) – Attleboro’s Eoin Kelleher reached on an error to start the ninth scored the winning run at Mason Field when Rob Furtado draw a bases-loaded walk. Senior Dylan Maskell had a very strong outing for the Bombardiers, tossing eight innings with five hits allowed, no earned runs and five strikeouts. Kelleher pitched a scoreless ninth inning to earn the win. Attleboro took the lead with two runs in the third but North clawed back with single runs in the fourth and fifth to tie the game. Franklin, 12 @ Canton, 4 – Final – Franklin’s offense got going early, plating three runs in each the first and second innings to earn a win over the Bulldogs. Jason Ulrickson earned the win in four innings of work, striking out four with just one earned allowed. Ulrickson also knocked in a pair of runs to help the offense. Both Jake Lyons (three runs, RBI) and Ryan Hodgkins (two runs, two RBI) went 3-for-3 while Cam Benham had two RBI and Matt Foley chipped in with two hits and two runs scored. Mansfield, 6 @ Oliver Ames, 3 – Final – Click here for a recap of the game. Sharon, 3 @ Milford, 4 – Final – Milford senior Nate Irwin threw a complete game, scattering six hits along with one walk while fanning five batters to earn the win. The Scarlet Hawks scored single runs in the first and third and tacked on two more in the fourth. Sharon scored one run in each the first, fourth and sixth innings. Anthony Arcudi (1-for-3, two runs, RBI double), Ryan Goncalves (2-for-4, run) and Alex Coady (1-for-3, RBI double) paced Milford’s offense. Aiden Arnold went 2-for-3 with a double and Drew Naisuler was 2-for-3 with a run for Sharon. North Attleboro, 13 @ Attleboro, 0 – Final (5 inn.) – North Attleboro utilized some small ball to pick up its sixth win of the season. Bella Erti struck out two, allowed six hits and walked one in five innings of work in the circle to earn the win for Big Red. Liz Morehouse had a pair of hits and knocked in four runs, Meg Barlow went 3-for-4 and both Andrea Miceli and Erti had two hits. Abby Gallagher and Sam Courtemanche both knocked in a pair of runs for the Rocketeers. and Lexie Campbell each scored once. Attleboro, 11 vs. Norton, 6 – Final – Alex Banner (two goals, three assists) notched a team-high five points while Zach Viau and Andrew Milliken (assist) each recorded a hat trick to pace Attleboro past Norton. Trevor Koppy made 12 saves in net while Matt Potter had nine ground balls. Foxboro, 5 @ North Attleboro, 6 – Final – North Attleboro scored three goals in the fourth quarter and kept the Warriors off the board to complete the comeback win. The game was tied 2-2 at halftime before Foxboro seized the lead with third goals in the third quarter. However, Big Red scored three unanswered goals, starting with Nick Moore and Jason McNeany (assist). Senior Colin Young scored the game-winner with under three minutes to play. Jack Dakin added two goals, Zach McGowan scored once and had two assists and Owen Costello had one assist. Dan MacDonald made 13 saves in net and also had one assist. Franklin, 19 @ Milford, 3 – Final – The Panthers picked up their 10th win of the season with a big victory on the road. Lauren Bissanti scored once and had two assists, Grace McDermott and Mairead Goguen each notched one goal and one assist and Lilly Kolb had two goals. North Attleboro, 5 @ Attleboro, 0 – Final – North Attleboro prevailed with a sweep of rival Attleboro, taking all five matches in straight sets. Zac Pfeffer won 6-4, 6-2 at first singles, Barsomo Nuay won 6-1, 6-0 at second singles and Alex Rinaldi won 6-0, 6-1 at third singles. Daniel Zhang and Ben Pfeffer walked away with a 6-1, 6-2 win at first doubles and Andrew Harris and Vikram Senthilakumaran won 6-0, 6-0 at second doubles. Canton, 0 @ Franklin, 5 – Final – Franklin’s Rahul Herur walked away with a win at first singles after a marathon battle with Canton’s Jake Wolicki. Herur prevailed 5-7, 6-3, 10-8. Eli Brooks took second singles 6-3, 6-2 and Rohan Herur won 6-2, 7-6 (8-6) at third singles. James Johnston and Derek Wu notched a 6-1, 6-1 at first doubles and Tyler DiPalma and Rahul Hosdurg won 6-3, 6-0 at second doubles. Attleboro, 1 @ North Attleboro, 4 – Final – North Attleboro didn’t drop a game in either first or second singles play in a win over Attleboro. Emily Chiasson and Jordan Willis each won 6-0, 6-0 at first and second singles, respectively. The team of Gabby Duva and Katie Demontigny won 6-1, 6-1 at first doubles and Leah Marceau and Tara Nair notched a 6-4, 6-1 win at second doubles. Attleboro’s Anna Nelson recorded a 6-4, 2-6, 10-5 win at third singles for the Bombardiers. Franklin, 2 @ Canton, 3 – Final – Franklin dropped just two games in winning first and second singles but Canton’s second doubles team prevailed in three sets to help the Bulldogs earn the win. Hannah Sweeney won 6-0, 6-0 at first singles and Anja Deric won 6-1, 6-1 at second singles for the Panthers. Canton’s team of Stelina Michaelidis and Sarah Hernandez battled back to win 6-7 (3-7), 6-2, 6-0 at second doubles. Kiki Karavas won 6-4, 6-3 at third singles and Julia Burkowski and Jena Moyle won 6-1, 6-2 at first doubles for Canton. Mansfield, 4 @ Oliver Ames, 1 – Final – Mansfield swept singles play and won all four of its victories in straight sets to knock off Oliver Ames. Senior Paulina Martin won 6-1, 6-1 at first singles, junior Sarah Doyle won 6-0, 6-4 at second singles and sophomore Elizabeth Elsner took third singles 6-3, 6-4. The team of senior Chloe Peters and sophomore Tessa Garufi won 6-3, 6-4 at first doubles. Oliver Ames’ Catherine Murphy and Ana Serjak won 7-5, 5-7, 6-2 at doubles. Attleboro, 41 @ Mansfield, 91 – Final – Mansfield senior Caitlin Whitman made the switch to the 400M hurdles and prevailed as the winner, crossing in 71.1. Whitman also anchored the 4×400 team that finished first. Senior Jordan Brill-Cass ran a PR in the 200M, clocking in a 26.3 while also participating on the winning 4×100 team. Sopohomores Val Buonora (800) and Maggie Riley (2 Mile) picked up wins as well.